This perfect cookie recipe which has already been written about so much in the food blog world comes from Good to the Grain: Baking with Whole-Grain Flours by Kim Boyce. I first tried it out by making whole wheat s'more cookies last month. They were some of the best homemade cookies ever. Whole wheat flour gives the dough a heartier, nuttier, biscuity flavor than white all-purpose flour. And it's less processed, which is another huge plus. Because it was a humid day, the dough was a bit wetter and stickier than usual; instead of forming perfect balls, I had to drop them onto the baking sheet with spoons. I was worried that they would spread too much in the oven, but fortunately they came out looking just fine. 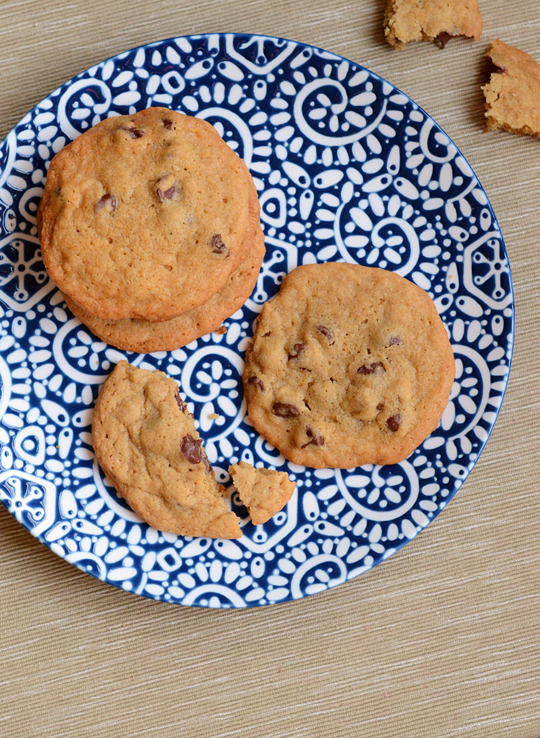 I love that these cookies are the best of both worlds, crispy around the edges but nice and chewy in the middle. And honestly, they don't taste like health food at all, just plain old all-American cookie goodness made a tad better for you with whole wheat flour. You can use white whole wheat flour or regular whole wheat flour, the latter which adds a slightly earthier flavor. As ancient as my AC is, it did allow me to bake about three dozen of these babies. I've reasoned that they make a perfectly acceptable breakfast, given that they are made of whole wheat. And the beauty of being an adult eating chocolate chip cookies for breakfast is that nobody can argue with you. Preheat the oven to 350 degrees F. Line 2 cookie trays with parchment paper or silicone baking mats. With a stand mixer fitted with the paddle attachment or a hand mixer, beat together the butter, brown sugar, and granulated sugar on low speed until just blended. Add the eggs one at a time, beating after each addition. Mix in the vanilla. Add the flour mixture and mix at low speed just until the dry ingredients are well incorporated. Scrape down the sides and bottoms of the bowl. Mix in the chocolate chips. Scoop rounded tablespoon-fulls of cookie dough and form them into balls with your hands. Line the cookies on a baking sheet about 3 inches apart. Lightly flatten the dough with your hands and press a whole square or broken square bits into the dough. Bake for about 15 minutes, until the cookies are golden brown on top. Transfer to a wire rack to cool before eating.